Here's the deal: I loved this book. I want to hug, kiss, marry this book. I can't love an inanimate object? Ohhh yes I can. This group of kids meet up at a fancy pants art camp every summer. They dub themselves "The Interestings" because they are pretty damn full of themselves. You would think that this would be a turn off. But it's NOT. Guess what? They are interesting. I adored every character in this book. Some are easy to love. A few are easy to hate. There are famous mothers, abusive pasts, shameful backgrounds, a possible crime, unrequited love...I could go on. I've got money to burn. How you like me now? The bonds that these kids form in their youth will stay with them throughout their lives. Two of them find success beyond their wildest dreams. One character loses himself. A few are forced to give up on their aspirations because of forces beyond their control. The way these friendships form, stretch, and break is marvelous. 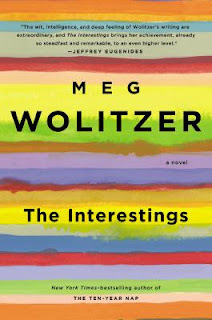 The Interestings is an engaging character study and a truly unputdownable story. Now, that is a ringing endorsement! I just got this book - can't wait to read it. Everyone is raving! As well they should be. It's a fantastic read! I hope you enjoy it Greg! Excellent, concise review! I loved it too. PS: I'm reading Z now and loving it. Highly recommend! Thanks Kelly :) Unfortunately I set The Movement of Stars aside. It wasn't speaking to me. It wasn't AWFUL, but it wasn't the book for me. I've heard great things about Z, I'll be looking forward to your thoughts on that one! Thanks for sharing your thoughts. I've been umm-ing and ahh-ing about this book, and now I think I'll give it a try. You make this one sound so good, Jennifer! I admit the description of it isn't enough to draw my interest immediately, but after your review, I think I'll give it a try. I know what you mean about the description. It didn't reach out and grab me either. I'm so glad that I gave this one a shot though, it was fab! I'm adding this book to my list now! I have added this book to my wish list! You made this story sound so intriguing. I hope you'll find time for this one Carol :) Thanks so much for visiting me! Too funny! OK - I'll look into this one. You've convinced me. I think it's the fact that they sound pretentious, and therefore it sounds a bad book, that actually makes it appealing. I like that they stayed friends despite only seeing each other once a year, too. That can be difficult when you're a kid. Yes, they do sound pretentious don't they? ;) They kinda are! I actually had to stop freaking out over this book to my book club friends because I didn't want them to have inflated expectations (even though it would still blow minds). I dare books to be better! I really liked her book The Ten Year Nap and I really want to read this one because, hello, theatre kid here! But my giant stack of library books says that I cannot get this one quite yet...sigh. 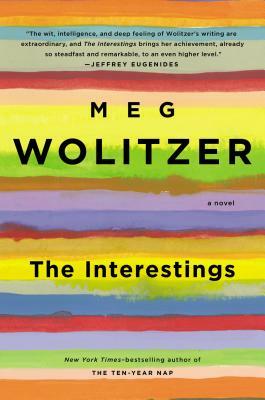 This has been on my list for ages - I loved The Wife and enjoyed The Uncoupling and generally think Meg Wolitzer is all sorts of awesome - ahhh so much to read so little time! I know Cat! The stack of books are never ending ;) I do hope you'll get to this one soon though, it's a gem. I initially passed on this one and then was convinced to read/listen to it. I have to say, after finishing 60 percent of the novel, I fear my gut instinct was correct. It really is not calling me at all, and I'm getting thoroughly annoyed at the fact that she can't seem to just say one name but has to say each character's full name. It isn't just Jonah but Jonah Bay, not Ash but Ash Wolf. I'll keep at it but it's going to take a lot for me to give it such a ringing endorsement. It sounds like it's not the book for you Michelle. You know what's funny? I normally go bonkers when people overuse full names like that. It's a pet peeve of mine. It's bizarre that I didn't even notice it in this book! After this awesome post and another from BookRiot, I think I'll have to go for it! I always trust your reviews :) Thanks, Jennifer! The second pic, of the girl kissing the tree, is a bit disturbing to me, but in a funny way. I can't look at it! I just heard an interview on NPR with Wolitzer about this book. Based upon that as well as your comments this sounds like a great character study. I also tend to like stories that follow old friends over time. I like those kind of tales too Brian. I like an epic sort of book that gives you a looooong time to get to know characters. Wolitzer has been popping up everywhere I look online. Not sure if I'm ready to take on another "lifetime friendship" book after Girlfriend in a Coma but I'll think about it. Ooooooh I want to read it so badly now!!!! Your gif choices make me laugh out loud. Ha ha ;) I'm here to serve! Having enjoyed some Wolitzer novels, I knew I wanted to read this...but after your review, it will be sooner rather than later. Thanks! I'm so glad that you loved it! I want to read this one, but was waiting for a review to clinch it for me. This one is it! Great review! It sounds fantastic to the max. Will have to read it when I crawl out from under the pile of books I have to review! Ha ha, I know exactly what you mean! I hope you do get to this one eventually :) I don't think you'll be disappointed!